I have realised recently that I spend a lot of time eating and looking for nice food when I am travelling. To be honest, I feel like we all do more or less the same thing, because food is a great way to know more about the place we are visiting. In fact, when I am planning to go somewhere I always check where I can get really nice food, including those delicious treats that you are not allowed to eat every day, of course. I actually did that when I was planning my trip to London and Brighton, so why wouldn’t I share with you all what I end up trying and tell you my opinion. I ate so many other things and I actually cooked at my Airbnb, otherwise, I would’ve had the most unhealthy diet ever. I am a big fan of CupcakeJemma and I watch all of her videos. In fact, I get so many ideas from her that I apply afterwards on the recipes that I post here on my blog. For this reason, I had to try her cupcakes. Well, I know she didn’t bake the ones that I ate, but I guess all the cupcakes that they sell taste very similar. The shop is very small and really cute, and yes, I had a fangirl reaction when I saw it. I only tried two of them and I struggled choosing which ones I wanted to get, but I finally went for Maltesers and Salted Caramel, which are probably two of my favourite flavours in a cupcake. The sponge was delicious, however, what I loved the most was the buttercream. I am really happy with mine, but theirs is so fluffy and soft and delicious and mouthwatering and asdfghjkl. I don’t think I can describe it in any other way. You need to go. 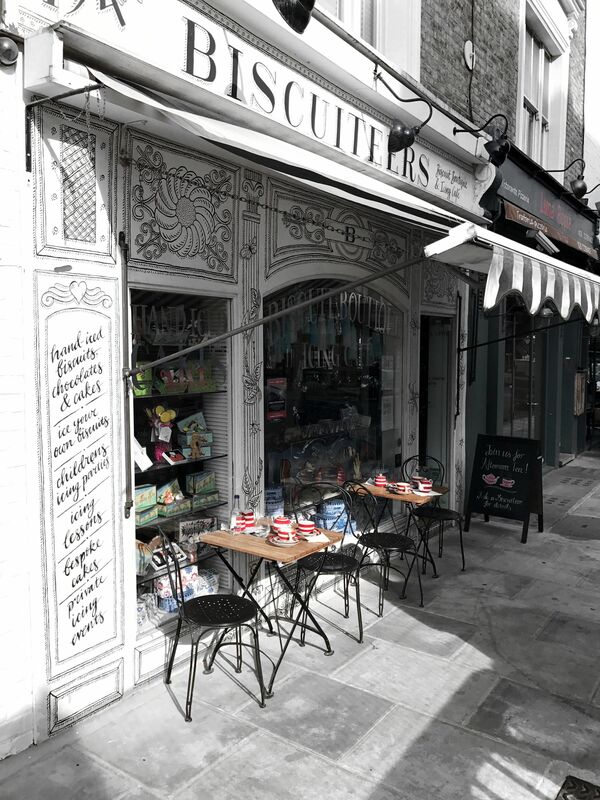 I have previously worked with Biscuiteers in the past, as you can see here or here. Their biscuits are really good and I love all their designs. You can basically find a biscuit for almost any occasion, which is great when you are trying to find a nice little present for someone. For this reason, I knew I had to visit their shop in Notting Hill, and I loved it. I did not buy anything in the end because I could not take it home nor had time to eat it there, but I had a look at what they were selling and fell in love with everything. You definitely need to try their products or go there and have a coffee with one of their delicious biscuits. I discovered Dum Dum Donutterie thanks to Zoella and PointlessBlog because they are obsessed with their cronuts, and they’ve shown them in their vlogs sometimes. In case you don’t know, cronuts are croissant doughnuts. I know it may sound very weird but they are absolutely delicious. 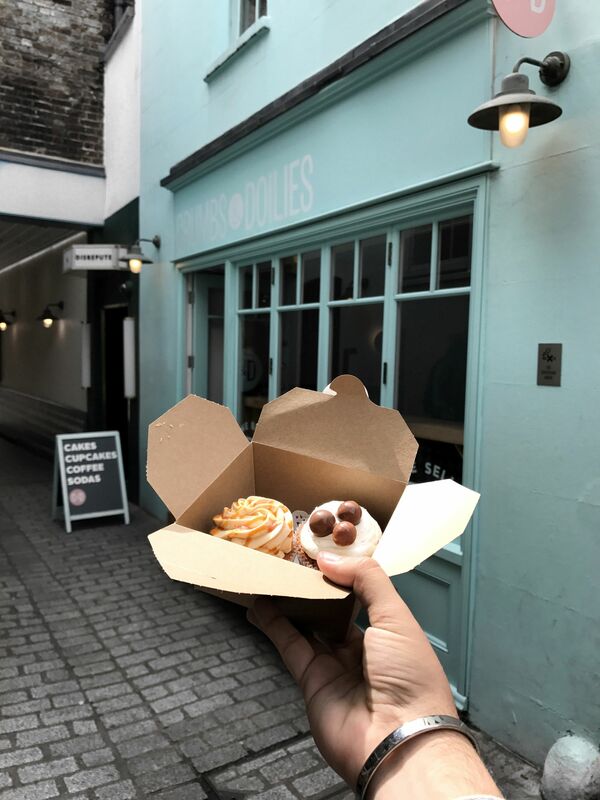 I went to their shop in Brighton one morning and I will never forget their Zebra Cronuts. They are probably my favourite, although the salted caramel one was also very good. They also sell mini doughnuts and ‘normal’ doughnuts, which are really nice too. You can find them in London as well, in Shoreditch. Harry Ramsden’s is a fast food restaurant that offers fish and chips and some other dishes. This may be shocking for some of you, but I decided to include this fast food restaurant chain because I think their meals are part of the British experience. I know they are not the best fish and chips you will ever try, but it’s good enough. 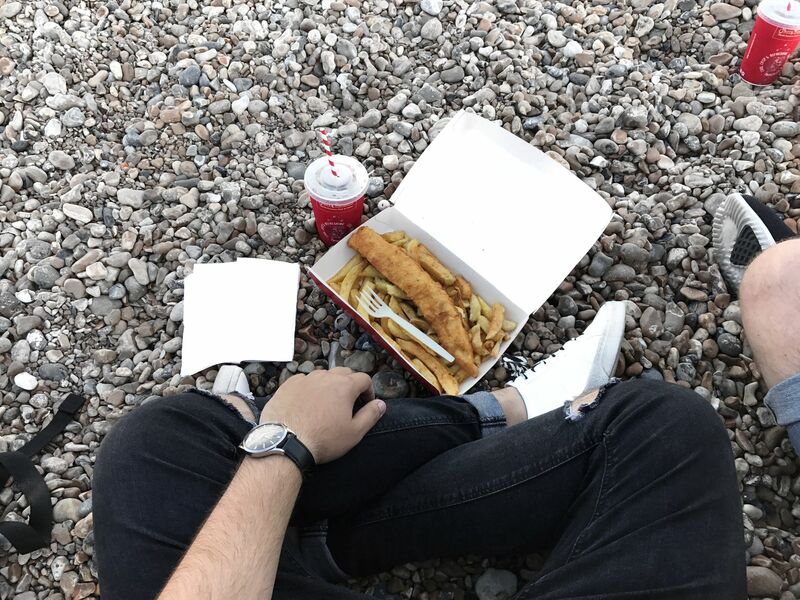 I quite enjoyed it to be fair, especially because I grabbed my take away and ate in on the beach. Give it a go and let me know what you think if you haven’t tried it before. 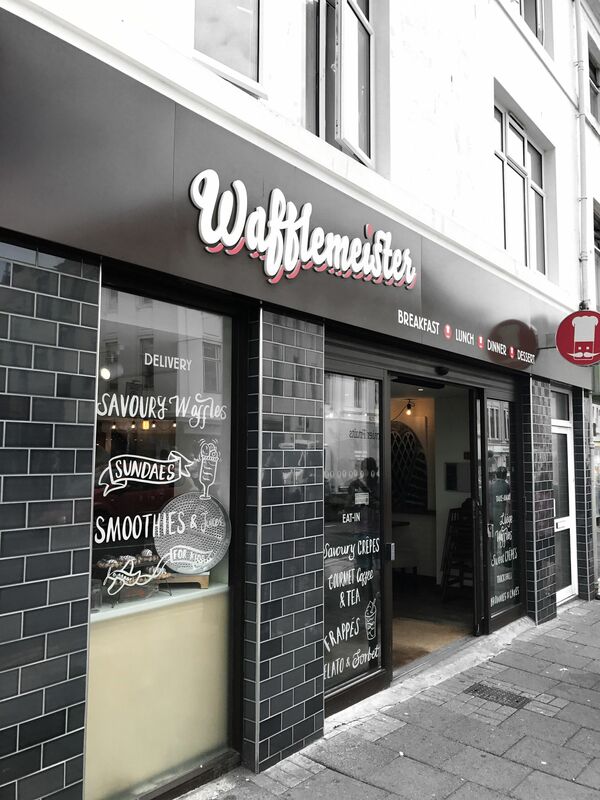 After having my fish and chips with ModishMale, he took me to Wafflemeister. I am glad he did because I had the yummiest dessert in there. I had a Nutella Sandwich, which is basically a waffle sandwich with Nutella in the middle. It also have some hazelnuts around as well as some ice cream and whipped cream. I was already quite full but I managed to eat it all. To be honest, I am not the biggest fan of waffles, as I always go for crepes or pancakes, but this one was AMAZING. I kind of want one now that I am writing this. It is also available in London and other parts of the world, apparently. Try to find one and have one of these sandwiches. I am sure you’ll understand my excitement afterwards. Whilst I was in Brighton, I decided to spend a day back in London. It was a really long day and I came back quite late, so I didn’t want to cook. For this reason, when I came out of the station and saw that tiny van selling some pizza I had to buy one for dinner. I tried a Margarita and a Brighton Blue (yes, I came back another day) and both of them were really good. 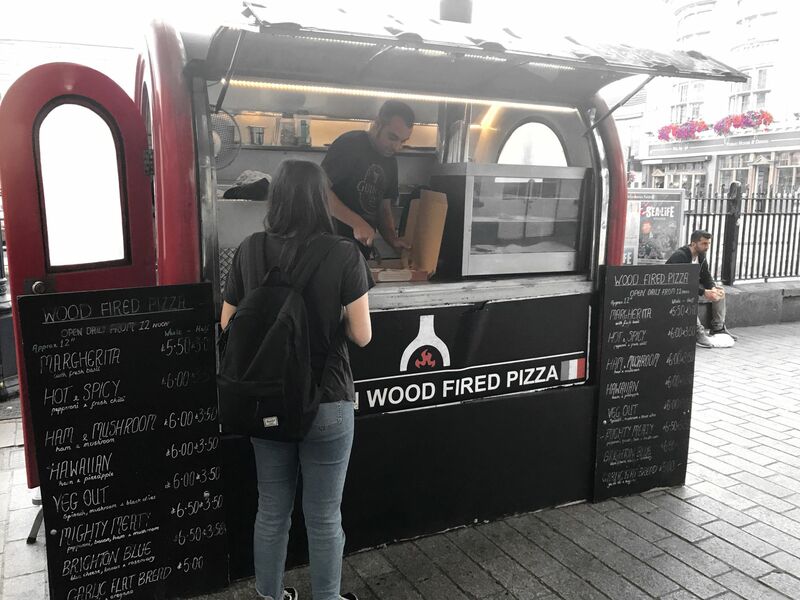 What I liked about them is that they are baked in a wood oven, which gives the pizzas a really nice flavour. I totally recommend them to you. Also, I found out that the man selling them is Spanish and he is very friendly. We talked about Zalfie, because apparently they like his pizzas. There are more flavours for you to choose and they are quite cheap, as you can see in the photo. I really wanted to try their ice creams because I had seen in PointlessBlog’s vlogs that they were really good. 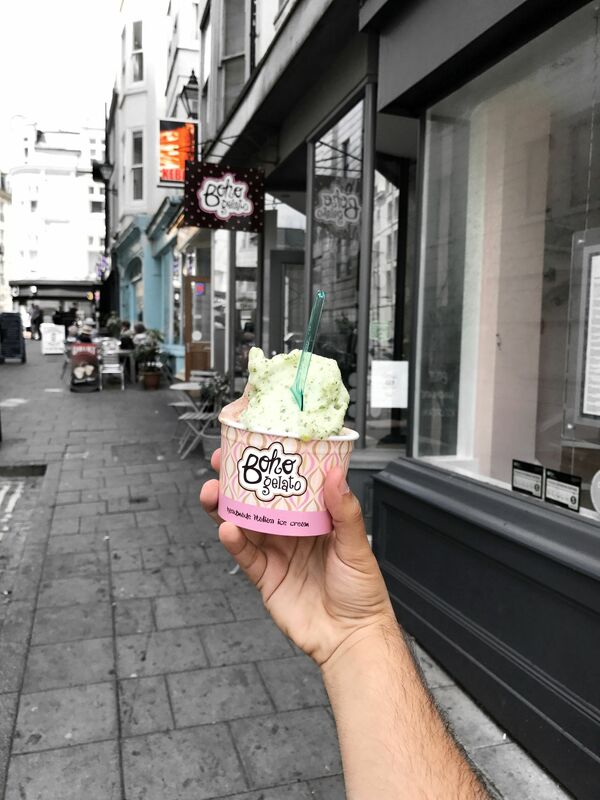 I know I have been to lots of places that they like, the thing is that I always watch their vlogs and they are from Brighton so I just had to try it all. To be honest, I LOVED Boho Gelato. There are quite a few different flavours available and some are a bit weird, but they are all delicious. Personally, I find really attractive the fact that their ice creams are handmade and you can honestly notice the difference in the flavour. I can’t remember all the prices but it wasn’t too expensive either, and there was a lot of ice cream in each cup. I wish I could try them all, but I guess I’ll have to wait till next time. This is the only healthy option I’m including in this post to be honest, and it is not even a place to actually eat. 42 Juice offers really good cold-pressed juices and also some little healthy snacks. I tried their Active one (it’s the one in the featured image), which is basically full of protein. I needed a boost and it actually gave it to me. Moreover, it was absolutely delicious and, obviously, really good for you. There are quite a few other drinks available, such as their activated charcoal water. There is not a huge difference in flavour, but it’s also better for you. I must say that I bought it mainly because it was black and, as you know, I love black. As you can see, this post is full of pastries and snacks. I am sorry but that’s what I love trying when I travel, as it is also a source of inspiration for my recipes. I know they are not the healthiest options, even though you can also find some healthy places around London and Brighton. However, I was on holidays so don’t blame it on me! 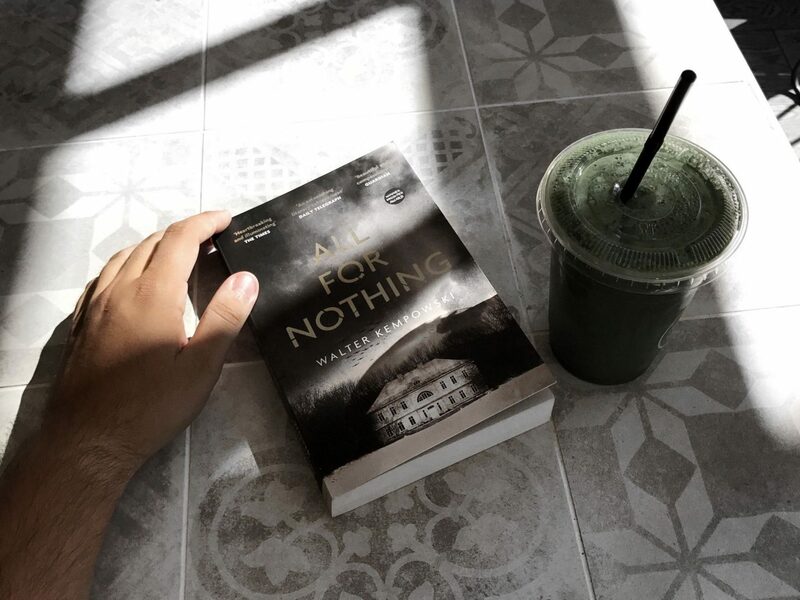 I hope you liked this post and don’t forget to let me know if you have ever tried any of these places or you’re planning to do so in the future. Okay, this post made my mouth water so much!! I’ve heard about all of those places (except the last one)! They are all perfect for instagram photos too.